As you probably already know, Simplelists is a service that is designed to make group email really easy… but what are people using Simplelists for, and why? The most common uses of Simplelists are: listserves, newsletters and email marketing. In this post we’ll look at listserves and cover newsletters and email marketing in the future. So a listserve uses email as the method of communication between a group of people. Note the word ‘between’ was used as opposed to ‘to’ – listserves provide two way communication. Usually every member can write an email to the group. This makes it different from a newsletter where only a select few can send emails. Privacy – this is the number one advantage for many groups over platforms like Twitter and Facebook. A listserve is private so that only members can see the details of emails – with social media platforms the whole world can see what is written. It is possible to adjust facebook settings so that not everyone can see posts but you are relying on every member of the group to be tech savvy enough to do this correctly – one mistake and details could be open to the public. Also, the social media companies themselves will monitor the content and use it for advertising purposes and in some cases even sell it to third parties! Social media is definitely not the best medium to use for private communications. Availability – everyone uses email! These days social media is very popular but not everyone uses the same platform (some prefer Google+, others Twitter, Linkedin, Facebook, 4Square and many more). Others still don’t use any form of social media. Each platform comes with it’s own idiosyncrasies that take time to learn and master. Email is something that almost everybody is familiar with. 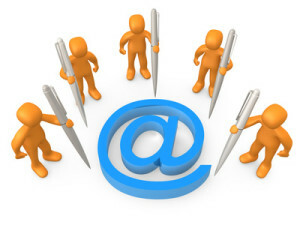 Another advantage of a listserve as a group communication tool is that an email is hard to miss. While you may forget to check an internet forum or a Twitter account for days (weeks?) most people are pretty good about receiving their email. Sure, it is possible to adjust the settings of a forum so that an email is sent every time a new post is made but again, you’re relying on every member of the forum to do this correctly if they are to keep track of things. Speed – listerves are generally quick to use and focussed; it is easy to login to Facebook to check up and find that you have lost half an hour watching videos of cats! Listserves have no distractions and are therefore a much better choice for business related groups.